There is something seriously wrong taking place in the markets today. This is also true in the paper gold and silver markets as well. For a paper precious metals futures market to function properly, there has to be ample supplies of physical metal. However, the ongoing trend of falling precious metal inventories points to big trouble in the paper gold and silver markets. 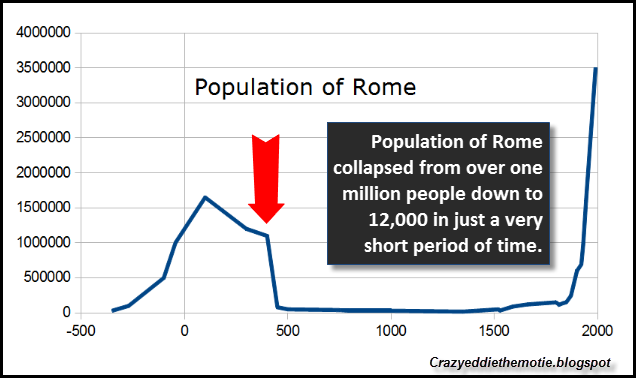 You will notice the population of Rome peaked at approximately 1.6 million people about 100 AD, started to slowly decline, and fell off a cliff at the end of the 5th century. The population of Rome fell from over one million people to 12,000 in a very short period of time. 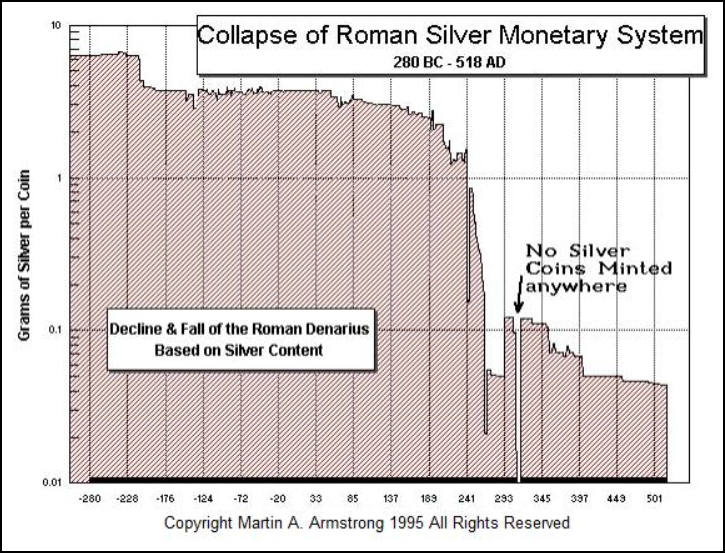 Thus, the collapse of the Roman Monetary System paralleled the disintegration of Rome itself. What took place in Ancient Rome, is also taking place in our global modern high-tech world. When Nixon dropped the convertibility of the U.S. Dollar into gold in 1971, a few years later… the gold futures markets started trading. No longer was the world’s reserve currency backed by gold, instead the Dollar was valued against the gold price traded on the futures exchanges. The chart shows the total amount of Registered Gold inventories on the top and the number of owners per ounce on the bottom. From 2001 to 2013, the number of owners per ounce of gold trend line was basically flat.. except for a few blips. But, something changed in 2013 when the price of gold was taken down from $1,600 to $1,150 in a short period of time. As the amount of Registered Gold declined, the number of owners per ounce shot up over 100 by the beginning of 2014. Then the trend line fell and remained flat until the middle of 2015… when all hell broke loose. This was at the time there was a threat of a Greek Exit of the European Union and concern that the broader markets may crash by the end of the year. The owners per ounce of gold shut up to over 500 when the Registered Gold inventories declined to only 74,000 oz recently. Since then, there have been some small deposits of gold into the Registered Category and the current owners per ounce is about 250. 1. Once again, the Comex delivery process is shown to be nothing but a Bullion Bank Circle Jerk where a bank takes delivery one month, only to turn around and issue the gold back out the next. Rarely does gold ever actually leave the Comex vaulting system and, today’s action notwithstanding, rarely does it even move from vault to vault. 2. Total Comex registered gold remains at all-time lows. Though some gold has recently been re-classified from eligible to registered as Feb16 deliveries begin, the total Comex registered gold vaults still hold just 145,000 ounces with 3,687 Feb16 contracts still open and standing, representing as much as 368,700 ounces of delivery obligations. Regardless, if we look at the owners per ounce of gold via the Registered Category, we can see how the trend line has gone exponential. Anything that heads into an exponential trend, doesn’t last for long. This was also true in the Roman Monetary System chart shown above. Now, what has taken place in the Comex Registered Gold Market, seems to be bleeding over into the silver market. 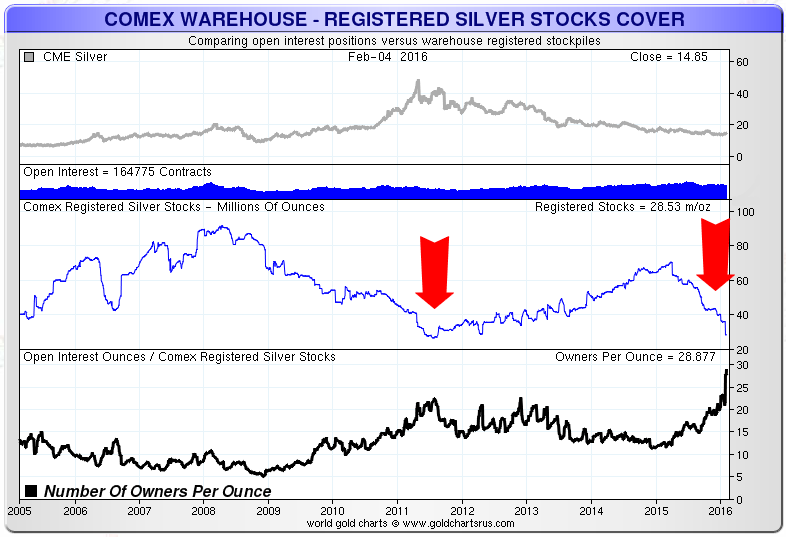 Comex Registered Silver Owners Per Ounce… Getting Ready To Parallel Gold’s Trend? 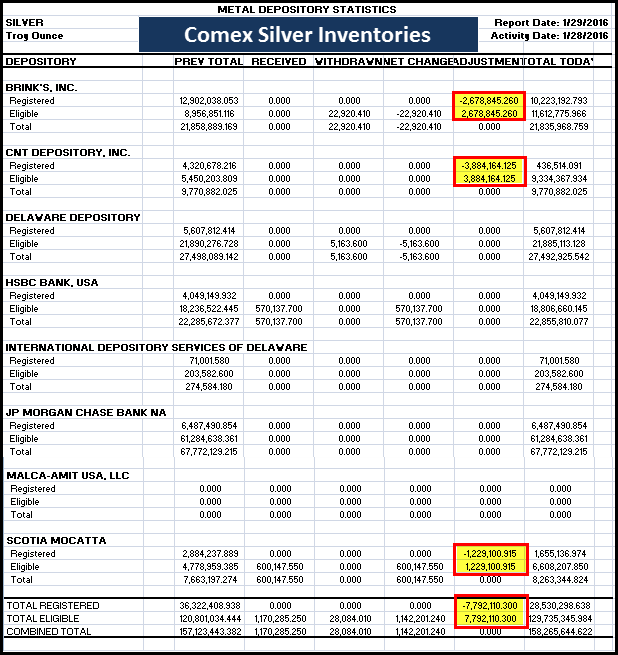 According to the data from Sharelynx.com, the Comex Registered Silver inventories and number of owners per ounce are heading in the same trajectory as gold. If we look at the one year chart, the number of owners per ounce of Registered Silver was approximately five in January 2014. The largest transfer of Registered Silver was from the CNT Depository of 3.9 million oz (Moz). What is interesting about the CNT Depository is that it now only holds 436,500 oz in its Registered Inventories when it had nearly 30 Moz back in April 2015. Before the collapse of the U.S. Investment Banking Industry and Housing Market in 2009, the owners per silver ounce declined from above 10 in 2005 to five in 2009. Then as the Registered Silver inventories declined from a high of 90 Moz in 2008 to a low of 26 Moz in 2011, the owners per ounce increased to over 20. As we can see, Registered Silver inventories began to build after the price of silver hit a record $49 in May 2011 and peaked at 70 Moz at the beginning of April 2015. Then as concern in the stability of the Global and U.S. Markets increased in the summer, record physical silver investment demand pushed wait times for retail products upwards of two months. Thus, the drain of Registered Silver inventories began in earnest. Now the number of owners per ounce of Registered (Deliverable) is heading towards the 30 figure. While this number isn’t as significant as the Registered Gold’s figure of 250… it has never been this high in more than ten years. Moreover, there is a divergent trend taking place. When the owners per ounce of Registered Silver went above 20 in 2011, it was due to increased industrial and investment demand as traders feared that the price would continue higher. In contrast, the new record 27 owners per ounce has occurred when the price of silver is now trading 70% lower than its 2011 peak with falling industrial demand. So, something just isn’t right in the paper gold and silver markets. I believe these charts are indicators that the coming collapse of the paper precious metals markets is close at hand. I am not saying it will happen today, next month or this year… but the trends are heading in an exponential fashion. Again… all exponential trends end in collapse… BAR NONE. My fear is the collapse of the paper gold and silver futures markets may usher in a NEW DARK AGE. There is plenty of rumor and conspiracy on the alternative internet that the powers that be are certainly planning something to cover up the disintegration of the U.S. Dollar Fiat Monetary System. In all likelihood, the coming collapse of the economic and financial system will happen virtually overnight. Unfortunately, investors who are still playing Russian Roulette in the broader markets may find out sooner than later, TIMING AN EXIT is folly. Owning physical gold and silver out of the banking system is the best alternative to the madness that is coming. The author is not affiliated with, endorsed or sponsored by Sprott Money Ltd. The views and opinions expressed in this material are those of the author or guest speaker, are subject to change and may not necessarily reflect the opinions of Sprott Money Ltd. Sprott Money does not guarantee the accuracy, completeness, timeliness or reliability of the information. Please tell us when all this will happen!